"Ford" redirects here. For other uses, see Ford (disambiguation). 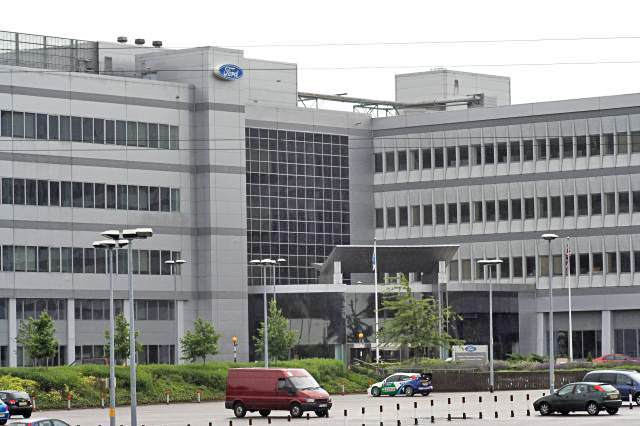 The Ford Motor Company (often known as Ford) is an American company that makes vehicles. This company is named after its founder, Henry Ford. In 1896, Henry Ford had an idea to make a Quadricycle, the first "horseless carriage" he built. This four-wheeled vehicle was very different from cars we drive now. It was very different even from vehicles Ford produced just a few years later. Even so, this was the start of Ford's career as a businessman. Until the Quadricycle, Ford's work had been experimental and theoretical. For example, in the 1890's, Ford built a gas engine on his kitchen table — just an engine with nothing to power. Enough people liked the Quadricycle, and much could be done with the it, so it led to the beginning of Ford's business. Ford Motor Company started on June 16, 1903, when Henry Ford and 11 business helpers signed papers to form the company. Their first Ford production car, the Model A, was sold in Detroit, Michigan a few months later. (This Model A should not be confused with their more famous Model A, which came out in 1927). With $280,000 (around 165 000 pounds), the early businessmen made what was to become one of the world's largest companies. Few companies changed the history and development of industry and society in the 20th century as much as Ford Motor Company. Ford Motor Company's most important contribution to automotive manufacturing was the (moving) assembly line. First implemented at the Highland Park plant (in Michigan, US) in 1913, this new method let each workers to stay in one place, to do the same job repeatedly as the vehicles went by on the assembly line. The line proved to be very efficient; it helped the company make more cars, and make them cheaper than other car companies could do at the time. Before using the assembly line, Ford made 12,000 Model T's in a year. With the assembly line, Ford could make 12,000 Model T's in just two days. Ford had discovered how to make more cars that more people could afford to buy. He even paid his workers higher salaries than other car companies and still made money. Henry Ford insisted that the company's future lay in the production of affordable cars for a mass market. In 1903, the company began using the first 19 letters of the alphabet to name new cars. In 1908, the Model T was born, and it was sold for 19 years. By selling 15 million Model T's, Ford Motor Company became a giant company which spanned the globe. They built plants in the Soviet Union, Japan and other places. Ford started making farm tractors, trucks and school buses. In 1925, Ford Motor Company bought the Lincoln Motor Company. It uses that name to build luxury cars. In the 1930's, the name "Mercury" was given to its mid-priced cars. Ford Motor Company was growing. 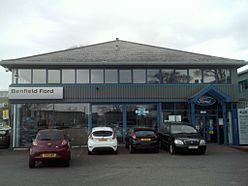 A British Ford dealership in Wetherby, West Yorkshire. William Clay Ford, Jr., great-grandson of Henry Ford, serves as the executive chairman at the board of Ford Motor Company. Jari-Matti Latvala driving the Ford Focus RS WRC 09 in 2010. A GT racing version of the Ford Mustang, competing in the Koni Challenge in 2005. Ford Performance Racing Ford Falcon V8 Supercar at Eastern Creek in Australia in 2008. The Ford Focus Flexifuel was the first E85 flexible fuel vehicle commercially available in the European market. Ford Escape plug-in hybrid test vehicle. 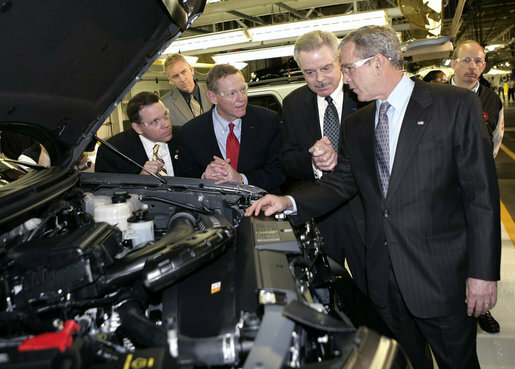 Mulally (second from left) with then-President George W. Bush at the Kansas City Assembly plant in Claycomo, Missouri on March 20, 2007, touting Ford's new hybrid cars. The Ford Fusion Energi plug-in hybrid shares its powertrain with the Ford C-Max Energi. Ford Motor Company Facts for Kids. Kiddle Encyclopedia.